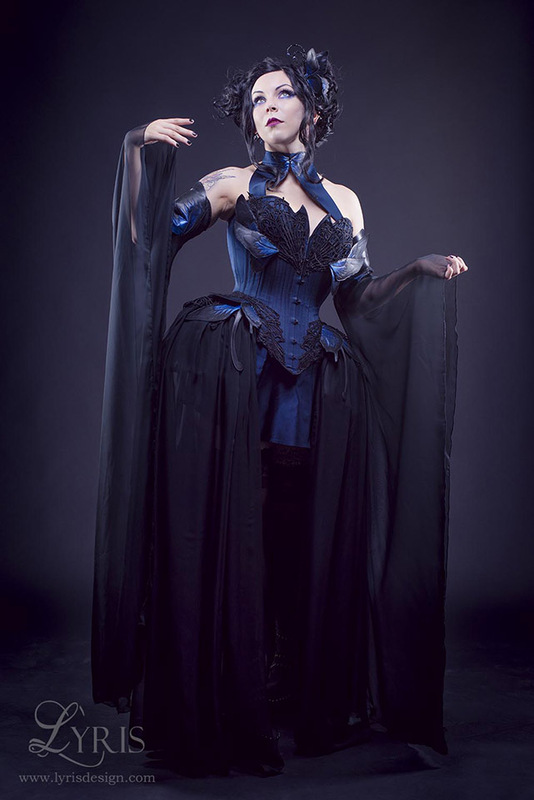 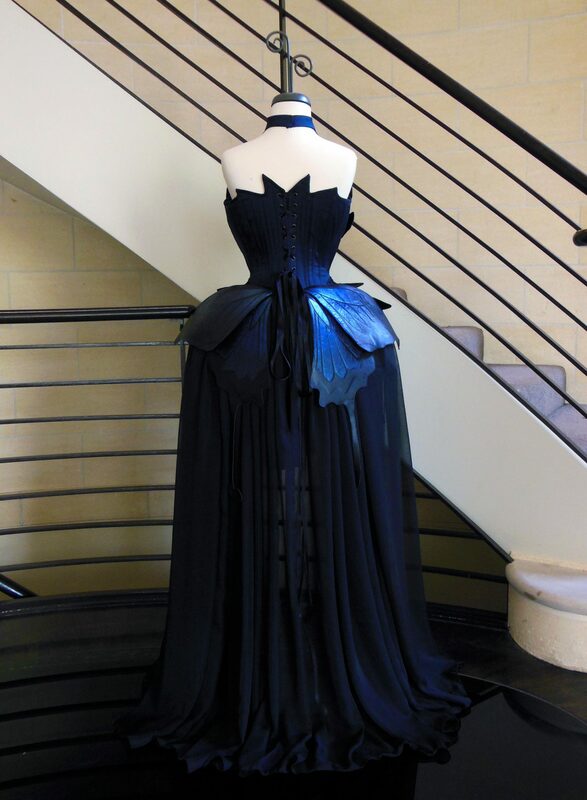 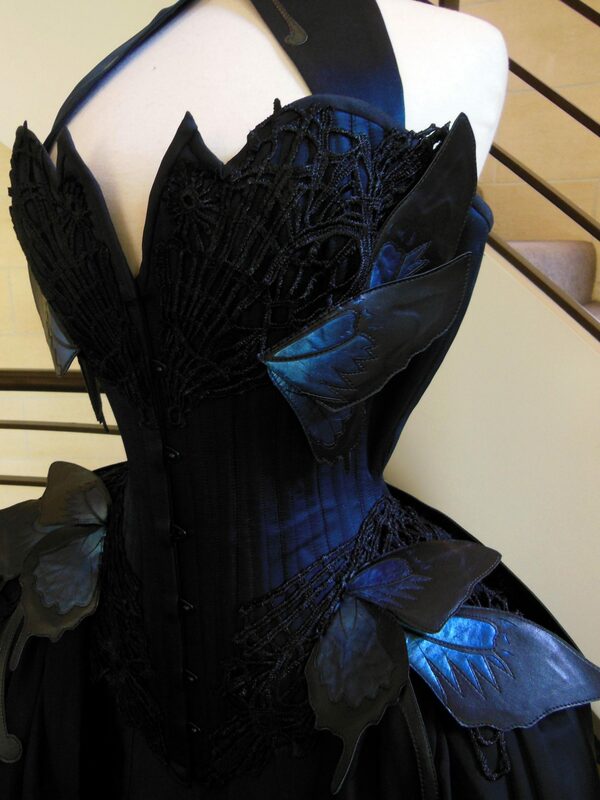 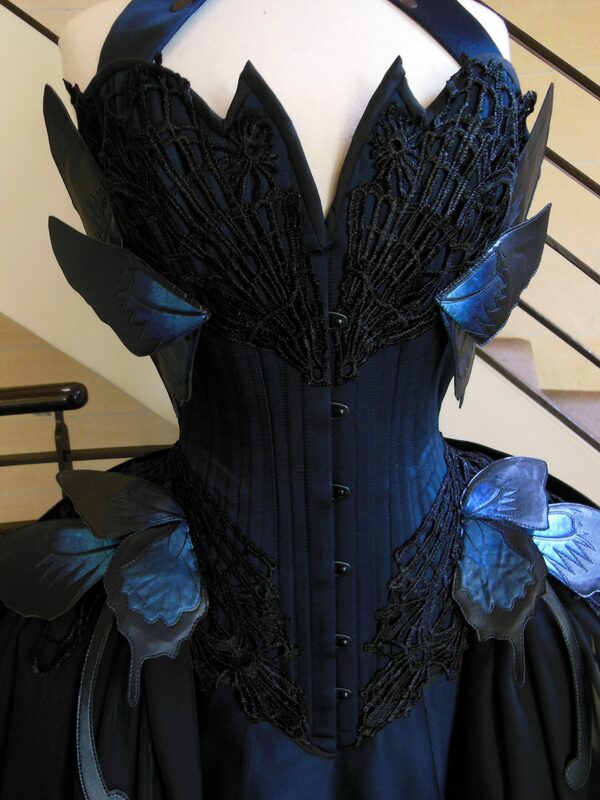 This inspiration for this corset came entirely from one small hide of metallic blue leather. 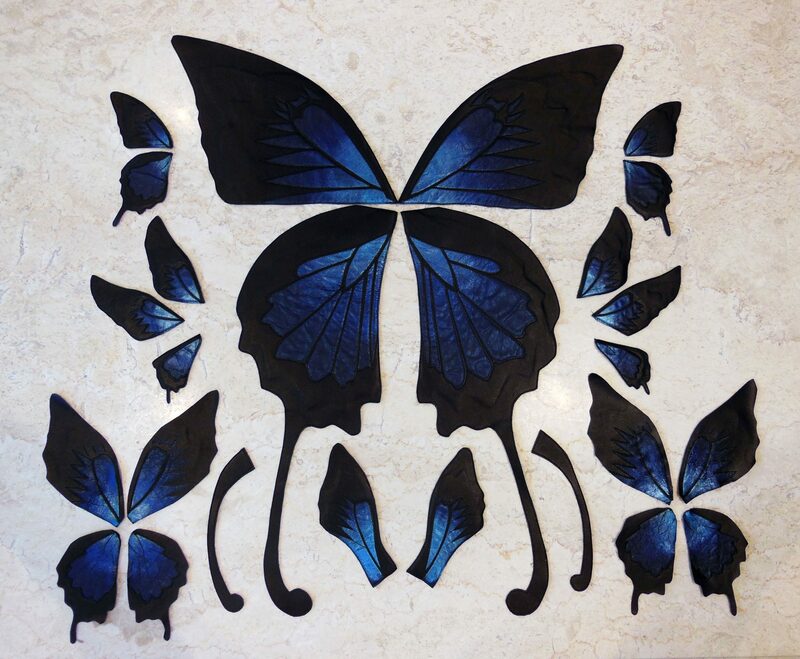 When I saw it, I had to buy it, and once I had it I couldn’t stop imagining butterfly wings. 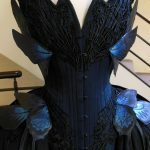 The soft texture and shimmer of the leather reminded me so strongly of the iridescence of a butterfly wing, and the colour brought back memories of sitting in my grandmother’s garden in far north Australia, watching the last flutters of blue Ulysses butterflies among the flowers as the evening set in. 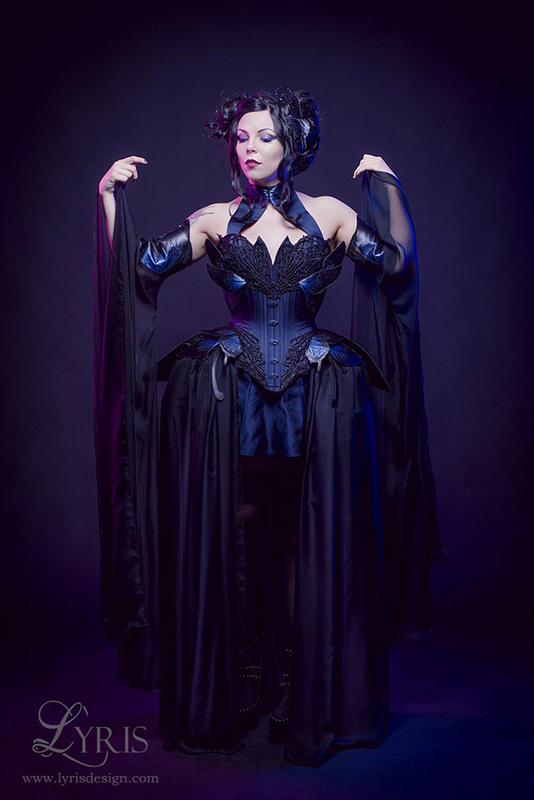 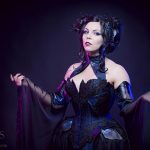 The Foundations Revealed 2018 corset competition, with it’s theme of insects, finally gave me the excuse I need to create this design I had been envisaging. 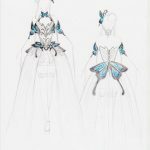 I wanted the design to make delicate use of the leather butterfly wing embellishments without looking tacky, and to have large sweeping curves and a softness reminiscent of the shapes and movements of a butterfly. 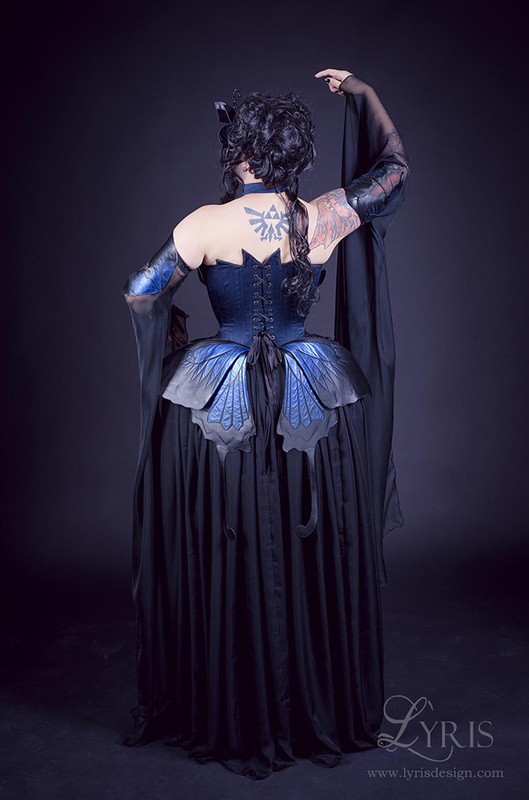 For this reason I went with a smoothly curving overbust corset, with the top edge irregular like the edges of a wing, and attached panniers to extend the hips out like the lower wings of a butterfly. 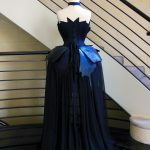 The chiffon overskirt and floor length sleeves added softness and a floating quality as the outfit moves. 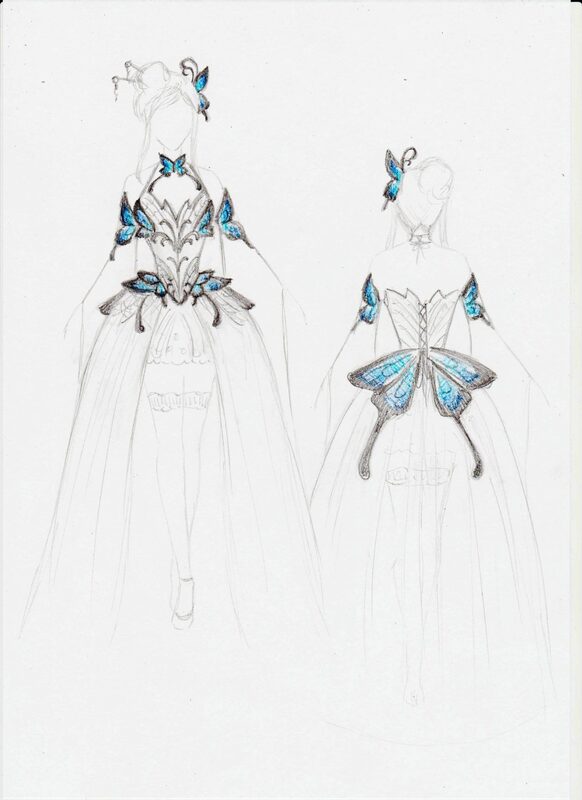 The design also incorporates several Japanese inspirations from my time living in Japan, in the form of the kimono cut sleeves and butterfly hair ornament. 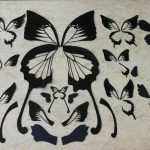 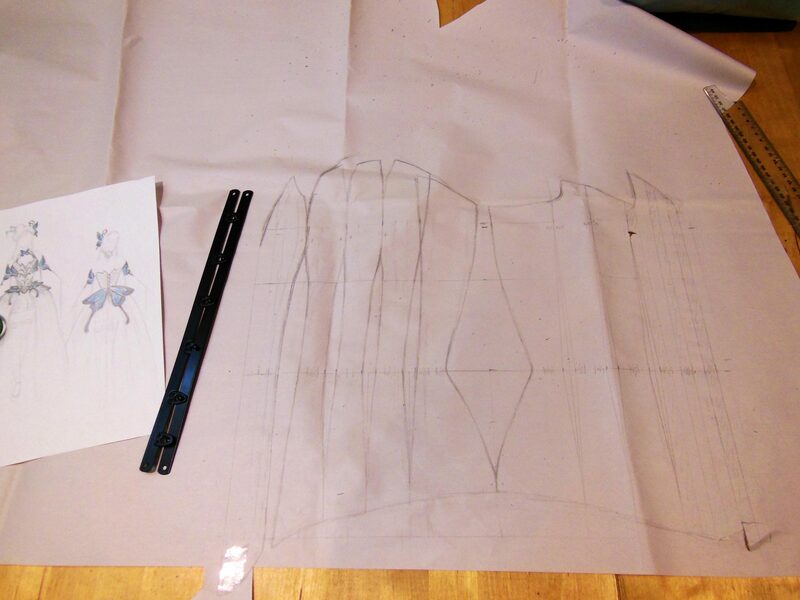 To create the delicate curves and soft shapes of a butterfly, I decided to draft the corset pattern with 18 panels. 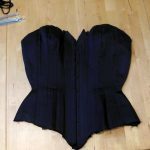 This is something new for me, as I generally draft 14 panel corsets, so it was fun to try out something different. 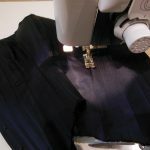 The inner layer is a single layer of coutil, with coutil boning channels, and a floating cotton lining. 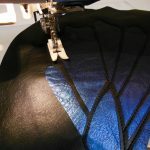 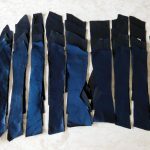 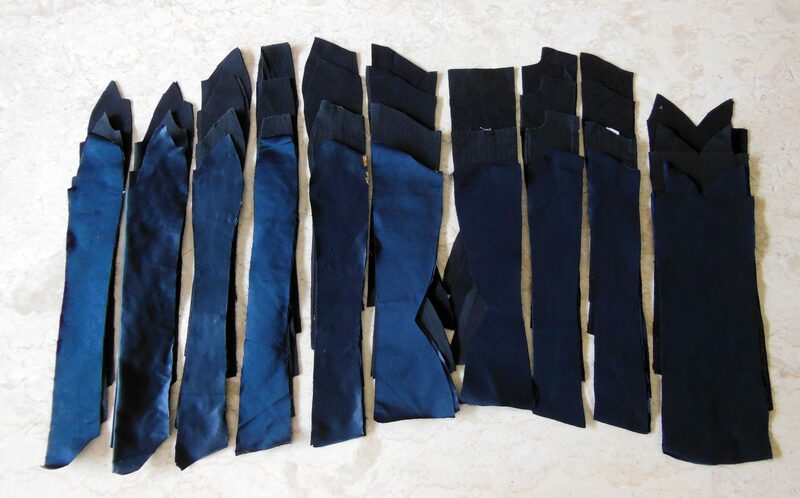 The fashion layer is indigo silk satin, backed with interfacing. 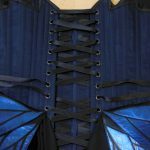 This was another fun challenge for me, as I generally do not like working with satin, but this silk satin was such a perfect colour, and its light sheen worked well to echo the luster of the leather and actual butterflies. 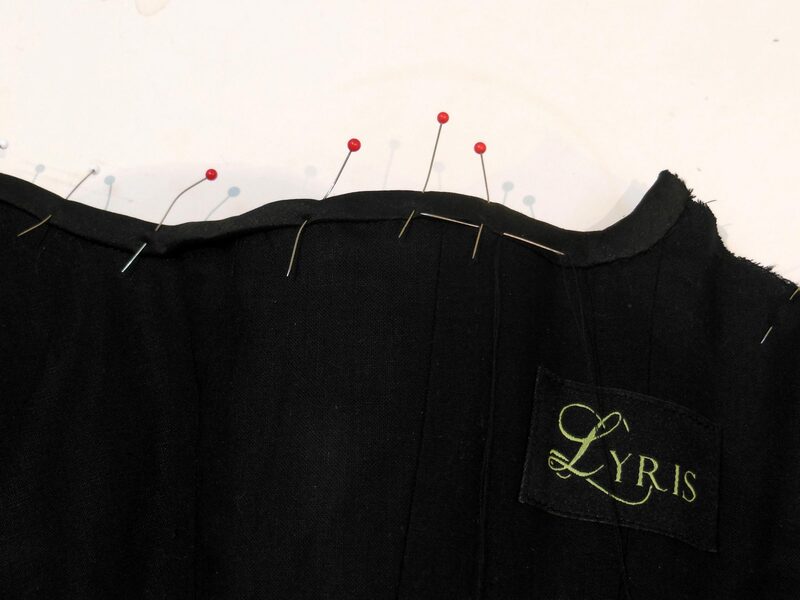 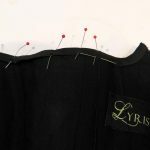 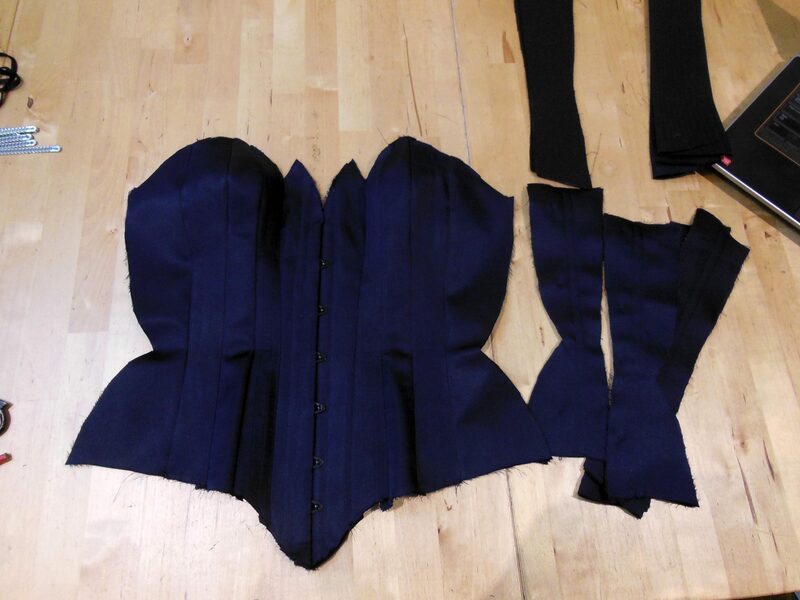 The base corset was carefully sewn together using roll pinning and internal coutil boning channels. 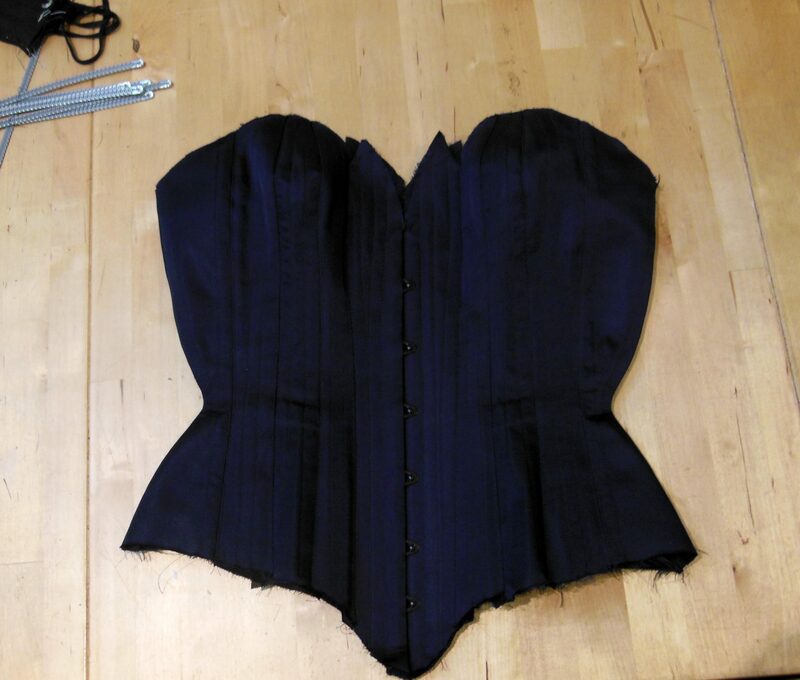 The finished corset had 24 spiral steel bones and 6 flat steel bones (on either side of the grommets and beside the busk), a black busk and black two part grommets. 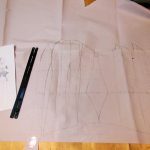 I also made a suspended modesty panel, with two layers of coutil, cotton lining and silk outer, 3 vertical bones and 2 horizontal. 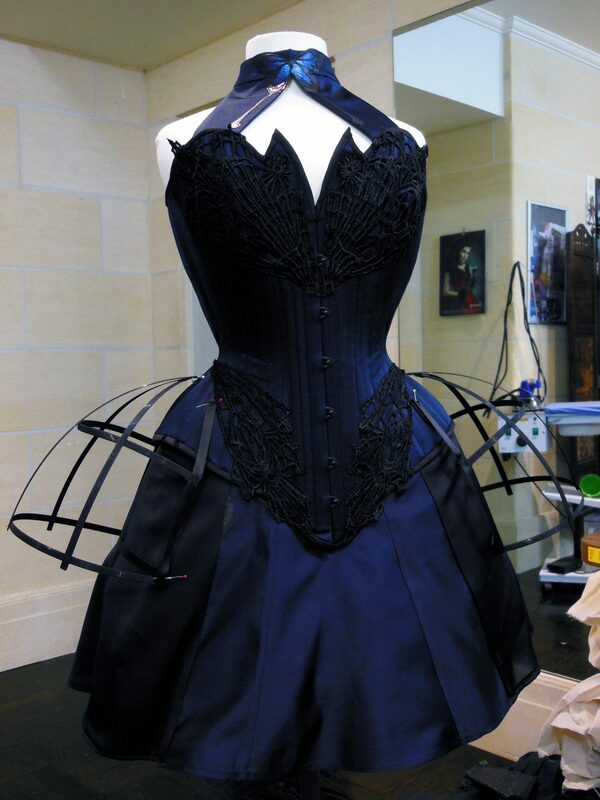 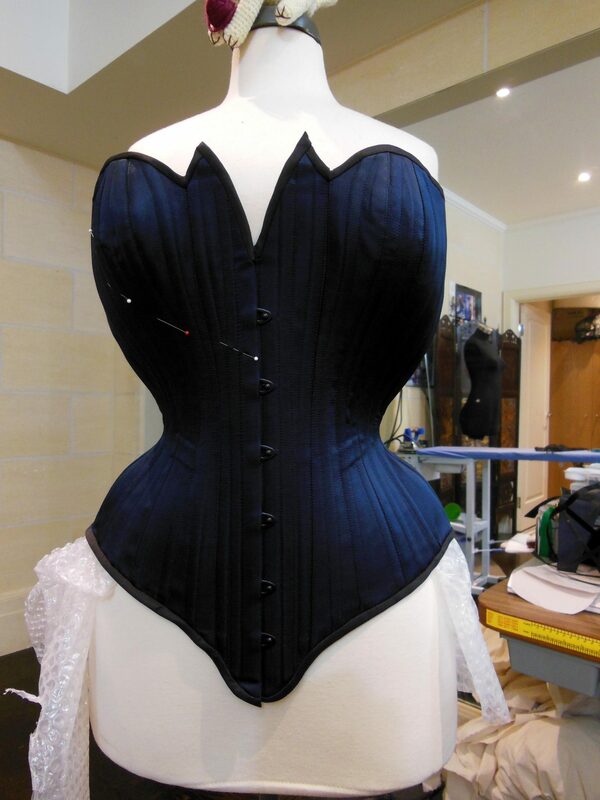 The corset was bound in black silk dupion bias, and hand finished on the inside. 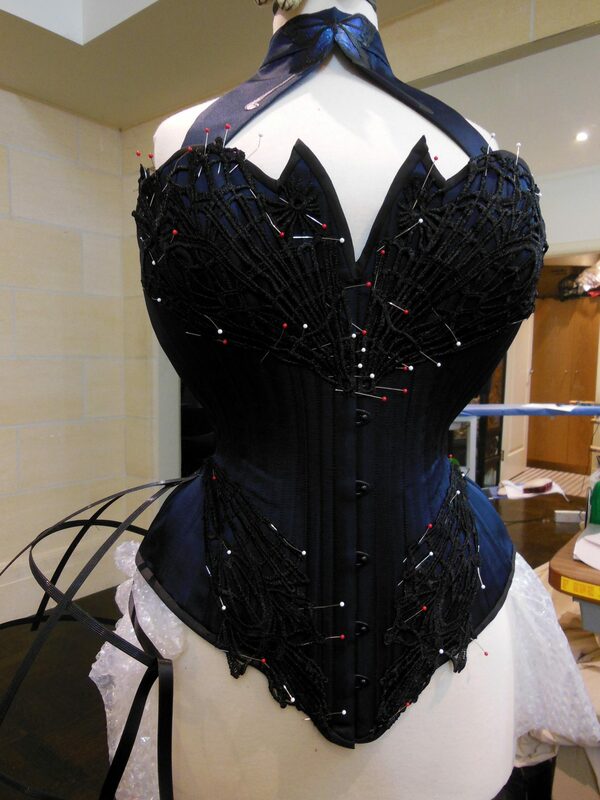 Once the base corset was complete, I could mark out the position of the lace applique. 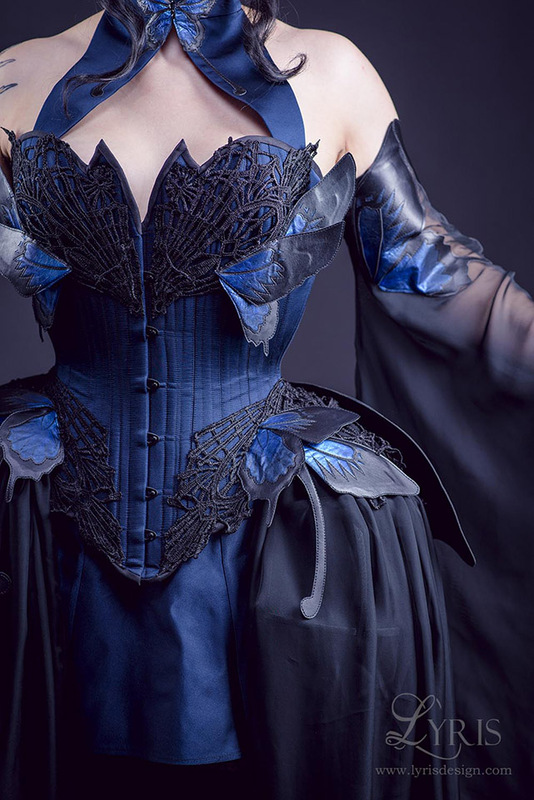 To achieve a pattern reminiscent of the veining of a butterfly wing but without being an outright butterfly lace (too tacky!!) 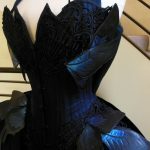 I used a heavy black guipure lace with abstract veined patterns. 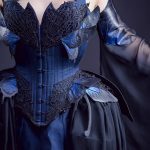 I wanted the lace applique to create some extra texture and subtle butterfly influences on the corset. 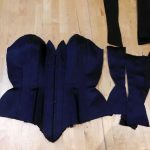 I then created some small and light panniers from black plastic boning, and hand sewed them onto the hips. 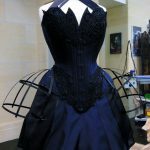 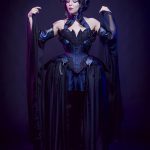 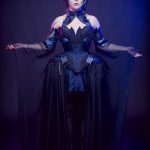 The overskirt is 6m of iridescent black chiffon, gathered and hand sewn to the corset, then draped with a little more of the guipure lace. 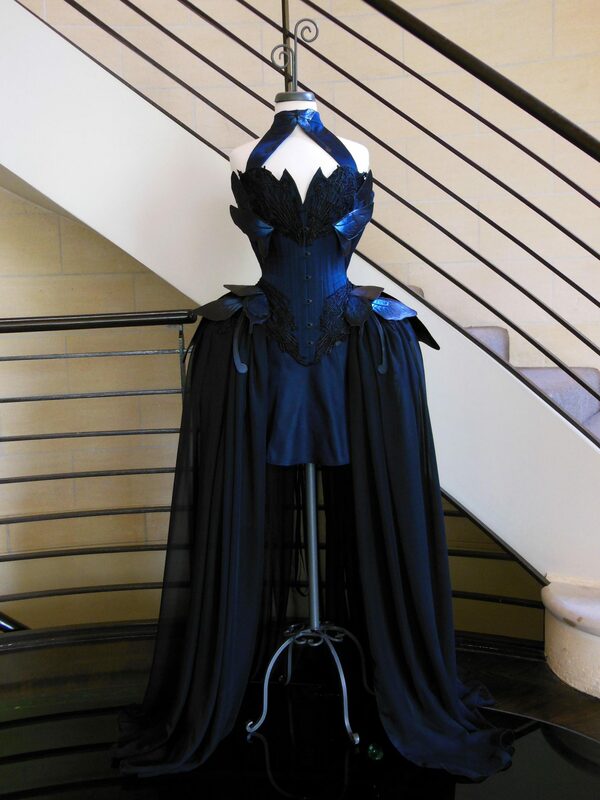 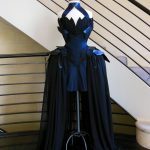 For the wing embellishments, each wing was created from a layer of the metallic blue leather, appliqued with black faux leather for the wing patterns, backed with black faux leather, and with a layer of coutil in the center to strengthen the wing. 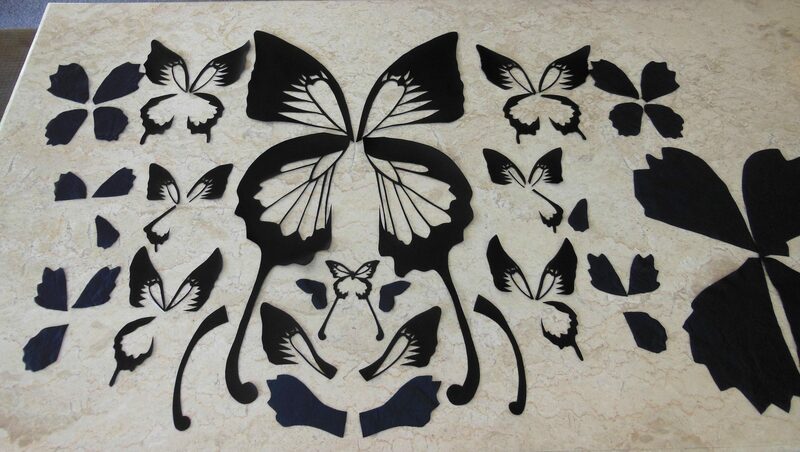 The inner layers were cut at different sizes to create a very subtle texturing in the black sections of the wing. 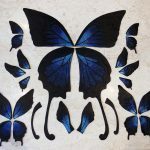 Though the Ulysses butterflies have large block sections of black, there is some very subtle patterning if you look closely, so this layering effect was to mimic that. 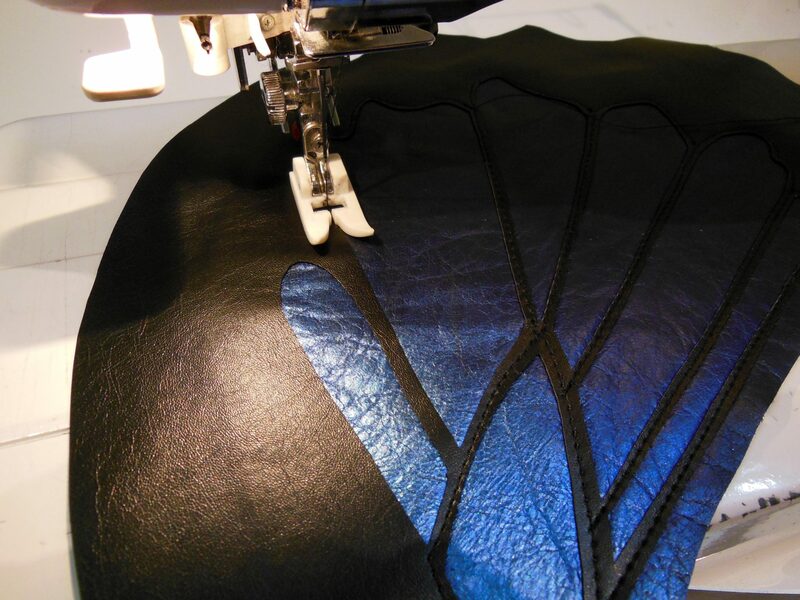 Black faux leather was chosen rather than real leather for its perfect smoothness and sheen, to contrast the organic texturing of the blue leather. 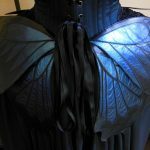 The blue leather was also hand painted with several shades of blue metallic paint to brighten the blue towards the center of the wings. 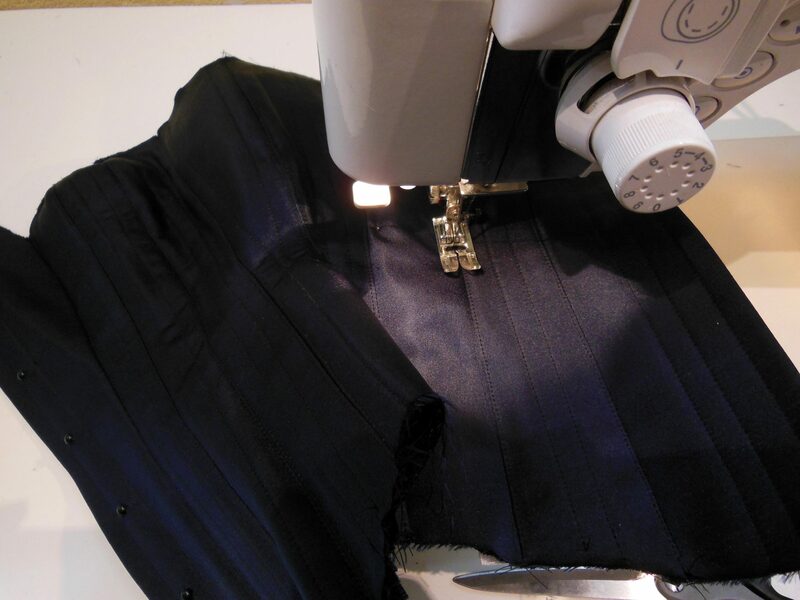 The pieces were all cut by hand, and machine sewn together. 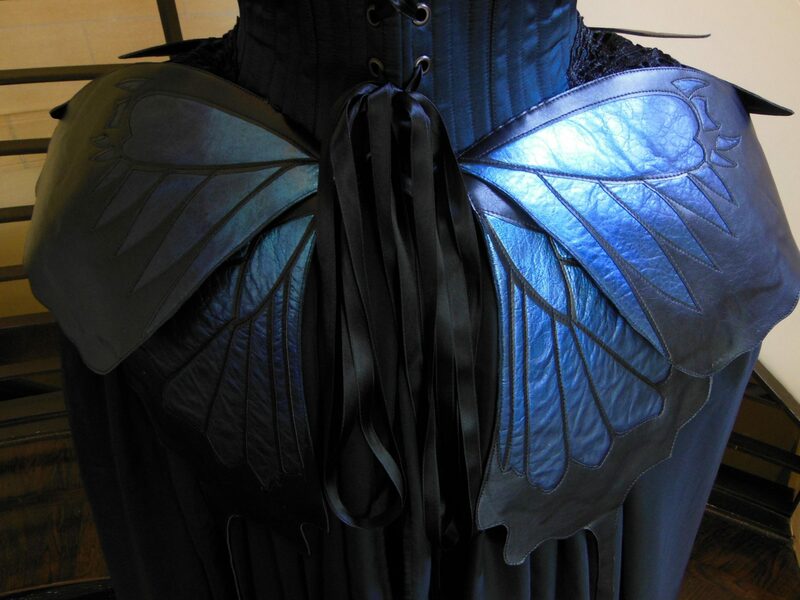 The wings were then carefully hand sewn to the corset, and machine sewn to the collar and sleeves. 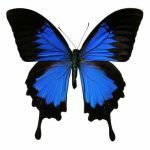 Another butterfly was attached to a hair clip with black crystal antennae, and the final piece was a blue silk mini skirt. 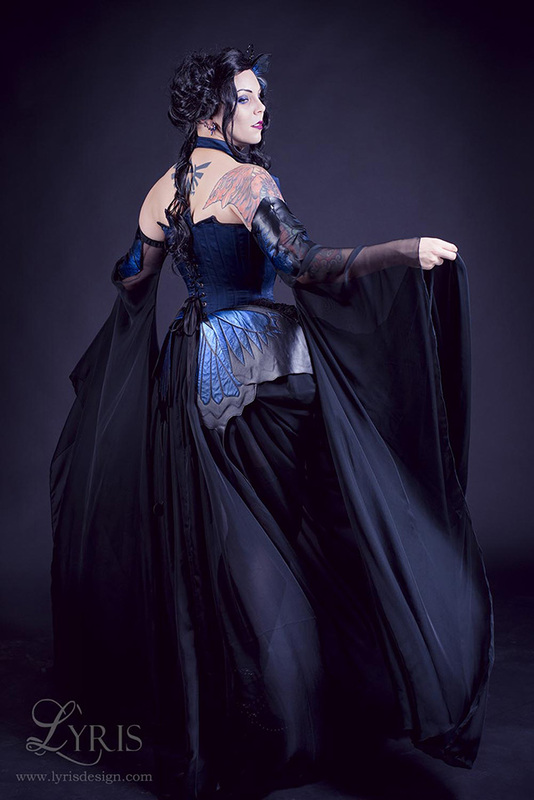 For the photoshoot, we did a simple studio shoot with the wonderful model and MUA Miss Twisted, and the talented photographer Sol Santana. 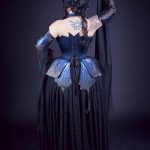 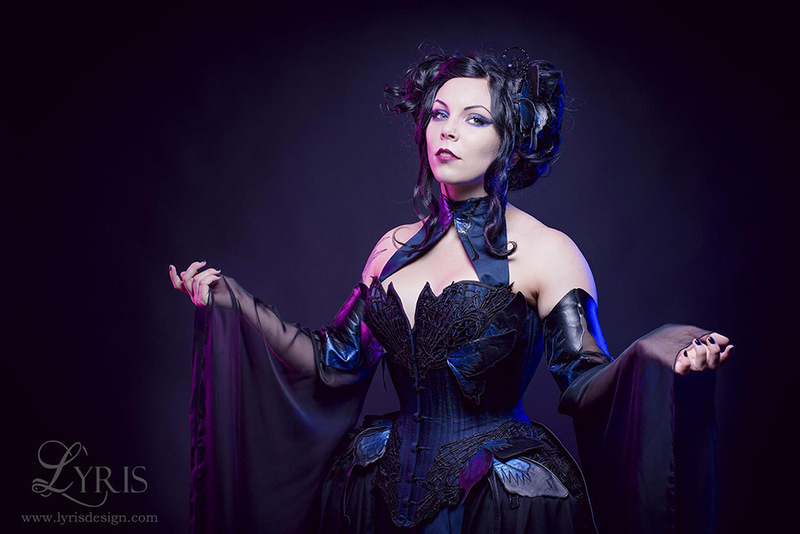 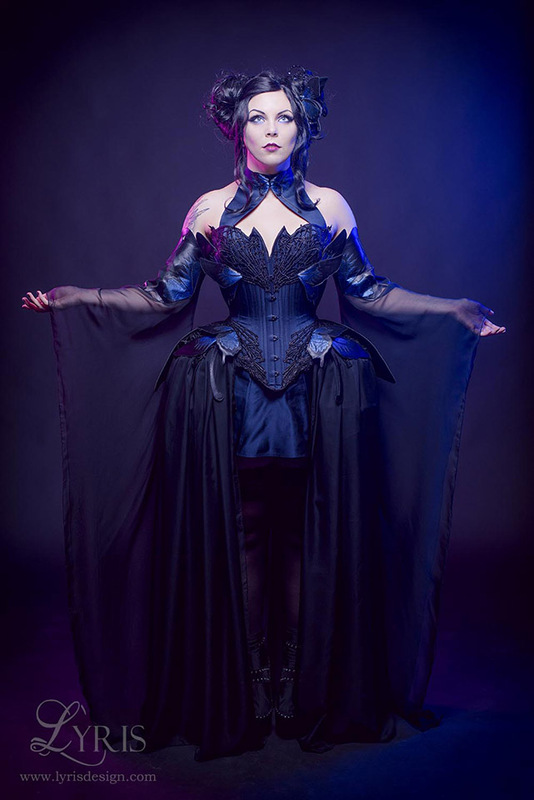 I am super happy to announce that this corset was one of four finalists in the advanced category of the contest! 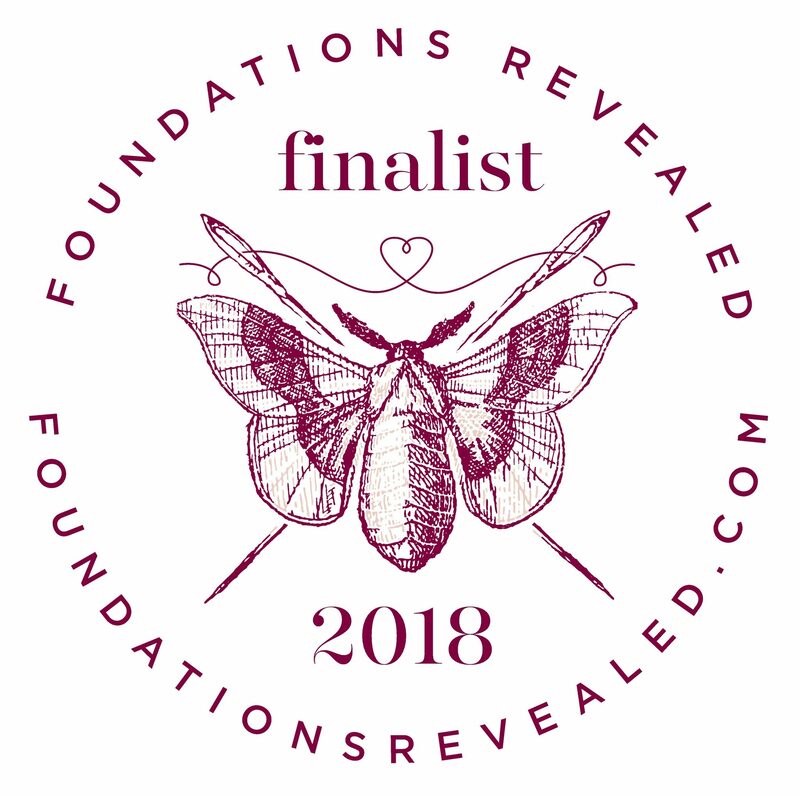 So humbled and excited!